In December 2015, during the official visit to Beijing of Karim Massimov, Head of Kazakh Government, China and Kazakhstan signed an agreement providing for cooperation in the field of energy, petrochemicals, telecommunications and atomic energy. The agreement is a part of the governmental “One belt, one road” initiative, an ambitious China’s program on the Great Silk Road revival. 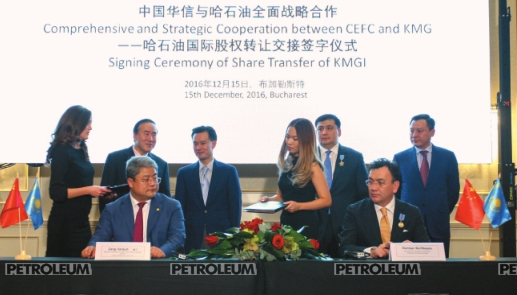 Memorandum of understanding was signed between the NC KazMunayGas and CEFC in the framework of the visit with the aim of international development of strategic partnerships in the oil and gas industry, which stipulated an intention of the Chinese company to acquire a part of KMG shares in KMGI. A little later, at the end of 2015, China Energy Company Limited acquired a controlling stake of the largest international group Dyneff SAS, which is the part of KMGI. Chinese investor was able to offer not only the highest price, but also the most favorable conditions for the further development and management of the company, which owns assets in France and Spain. KMG International is the new name of a successful group of companies -The Rompetrol Group N.V. since 2014. In 2007, the Kazakhstan’s national petroleum company acquired 75% of The Rompetrol Group N.V. shares, and in 2009 it bought another 25%. Thus, creating an enterprise, integrating business operations between the oil and gas fields in Central Asia and related markets throughout Europe. The Rompetrol is the main brand of KMG International. It is used by the group for refining operations, exploration and production, as well as the retail sales in Romania, Moldova, Bulgaria and Georgia. KMG International group, with over 7000 employees, operates in 11 countries of Europe and Central Asia. The main activity of the group includes trading, refining and petrochemistry, retail sales and marketing, additional exploration and production operations, and other oil-producing services, such as drilling, design, procurement and construction management (EPCM) and transportation. The company owns Petromidia, which is the largest oil refinery in Romania with processing capacity more than 5 million tons per year. The KMGI Group also owns Vega oil refinery with 110 years of history, which changed it’s traditional refining units to produce and supply with the special purpose products, obtained from semi-finished materials, manufactured by Petromidia. Thus, both refineries form an efficient complex on processing the raw and semi-processed materials , and obtaining products of higher processing degree. The strategic location of the Petromidia refinery in in Constanta port allows quick delivery of crude oil and petroleum products for KMG International subsidiaries in Moldova, Georgia, Bulgaria, as well as for other traditional partners in the Black Sea region. The Group also runs major trading operations with oil and oil products in the regions of the Black and Mediterranean Seas through KMG Trading AG, its subsidiary, headquartered in Switzerland. KMG International Group owns more than 1000 distribution points in Europe (in Romania, Moldova, Bulgaria, Georgia), operating under the Rompetrol brand. Reducing costs and increasing revenues. The total capital costs of KMG International for the period from 2008 to 2015 years amounted to about 1.1 billion USD. The money was credited by the main shareholder, NC KazMunayGas, with the purpose of an extensive reconstruction, which resulted in transformation of the Petromidia refinery into the largest company of its kind in Romania and into one of the most sophisticated enterprises in the Black Sea region. Since 2013, after completion of the “Package 2010” investment project and a number of transformational initiatives that have had a strong positive effect on subsequent financial and operating results of the Petromidia refinery, the plant increased its processing capacity to 5 million tons per year, processing results improved for 35%. The produced fuel complies with new Euro 5 standards in the EU and Romania. The diesel output increased for 8%, reaching up to 50% for the compliance with the market demand. In addition, the operational process of the refinery was adjusted to fully conform with European and Romanian environmental requirements. In 2016 the company processed 8 types of crudes and alternative raw materials in the atmosphere block, as well as the Omani crude oil, which was processed for the first time in the history of the Petromidia refinery. At the same time, 90% of refined raw materials at the Petromidia refinery is the West Kazakhstani oil, transported via the Caspian consortium pipeline . The remaining 10% is a mixture of other oil grades, such as Siberian Light and the Urals. The implementation of the program on operational cost reduction and program on optimization of production processes, increasing the output of light oil products (gasoline, diesel fuel, kerosene) in a total volume of finished products, as well as increased refining margins in Europe have led to a massive improvement of KMGI financial indicators. The company has evolved into a successful profitable asset, which already brings the first dividends. For 9 months of 2016 and for the first time since the asset was acquired, KazMunayGas International reached the operational EBITDA index in the amount of $145 million dollars. Taking into consideration the fact that in 2012, at the time of new management work commencing, the consolidated EBITDA level amounted to only $79 million, and net loss was $156 million, it is not difficult to calculate that in 2016 EBITDA index increased in almost 3 times. Now the company sets the goal of further growth. Its implementation will be possible in cooperation with a Chinese partner. The agreement, signed in December of the last year, confirms the parties' intention to implement a deal on selling 51% of KMG International shares, as well as a package of documents with changes. “Within the frameworks of reached agreements, CEFC undertakes several obligations on investing to the countries of Europe and Silk Road, and developing the projects in the sphere of oil refining and gas station network development in cooperation with KMG. The final stage of the deal will be its harmonization with the competent authorities of Romania and the European Commission, as well as obtaining the necessary approvals from financial institutions. It is expected that these procedures will be completed in the first half of 2017”, stipulates the press release of KMG International. According to the reached agreements, the Chinese investments to KMGI will be not less than 3 billion USD. Upon completion of all legal procedures, China Energy Company Limited and KMG International will manage the business in Romania on a parity basis. It means that the partners will jointly take all key decisions, relating to finance, personnel and strategy. The company will create more than 3 million new jobs, including those for Kazakhstani citizens. “We intend to increase the refinery processing capacity to 10 mln tons per year, to build up to 200 new gas stations, to ensure the development of industrial services in the area of upstream and downstream, as well as to build a thermal power plant at Petromidia refinery site. Investments made to date, the implemented business model and further business partnership will constitute the definite factors that shall help us to look to the future with optimism in the context of further business growth", said Zhanat Tussupbekov, CEO of KMG International. The deal is clearly beneficial both for Kazakhstan and China. 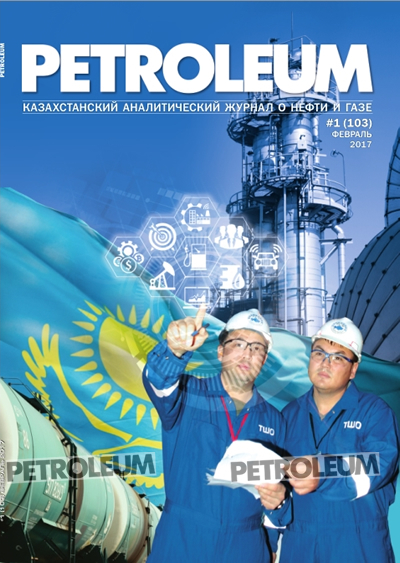 Partners from China extend the logistic transportation network on the Great Silk Road, and Kazakhstan benefits from strengthens its position in the global market of petroleum products, and also the country implements the privatization program of the assets that are not strategic for the national company.